The Health-O-Meter G6 body composition analysis scales are sophisticated, yet affordable, devices that help physicians address obesity and fitness in their patient populations. Performing a detailed body composition analysis and educating patients about the results provides a valuable service that can impact patient health while helping physician practices grow. 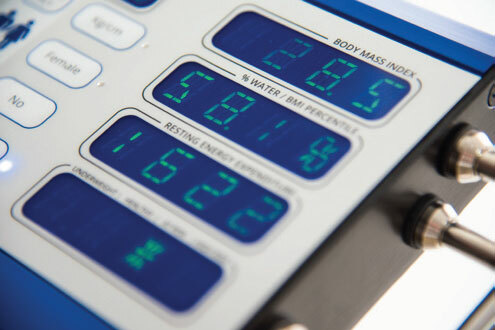 A whole body composition scale, also known as a body mass scale, is an important tool in health and fitness industries because of its ability to provide detailed information about a patient’s total body composition. Even basic body mass scales measure percent body fat, a key marker that differentiates between the different body tissues of lean mass and fat mass. Traditional scales do not offer this information. The techniques and technologies utilized by differing devices are as varied as the devices themselves, but most all professional body composition scales will measure or calculate certain basic information, such as total body weight, percent body fat, percent lean mass, percent body water, body mass index (BMI), resting metabolism, and other critical health factors related to total body composition. Because of the variety of information they provide and its usefulness to health, weight loss, athletic, and research objectives, body mass scales are integral components of these programs throughout the country and the larger world. A device that measures whole body composition, rather than simply upper body composition, is generally considered to be a more accurate and reliable instrument. This is due to the fact that while fat is generally distributed somewhat evenly throughout the body and a whole body measurement can be calculated, such a technique is fundamentally inferior to a device that actually measures body composition from head to toe. How does this operate? The subject first removes his/her shoes and socks and steps onto the weighting platform. After entering some basic information like age, height, and gender, and other information depending on the individual device manufacturer, the patient grabs a pair of handles and an undetectable electric current is sent throughout the entire body, allowing for the calculation of the whole body composition. Because the value is actually measured, instead of simply calculated from an upper body only reading, it is more accurate, reliable, and repeatable. There are a variety of upper-body and lower-body devices in use by various industries, from health and weight loss to fitness and academic. Body mass scales that measure body composition over the entire body, rather than half the body, are inherently more accurate because of the nature of the reading. A whole body composition scale is a superior option for organizations seeking to incorporate body composition testing into their programs, and while half-body devices are popular, they do not offer the accuracy and repeatability of their whole body counterparts. The transformation of raw impedance data into body composition is achieved through the use of prediction equations or algorithms. Prediction algorithms are created by collecting the “raw impedance data” from a study population of people. This same study population has their body composition determined by alternative known standards such as radioisotope dilution or hydrostatic weighing. In this case, Valhalla has scientifically and collectively collected thousands and thousands of set of impedance data under laboratory controlled conditions. Linear regression analysis is then conducted on these data and used to create a prediction equation. This prediction equation generates an equivalent body composition analysis to the reference standard when the impedance data of a subject within the population study is entered into the equation. 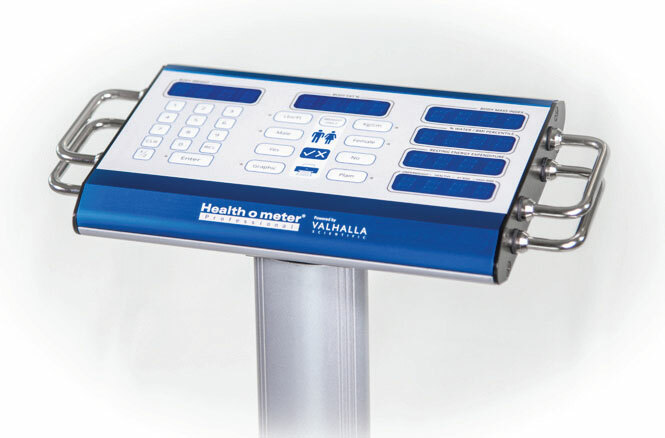 Valhalla has developed a proprietary predication equation incorporating Ohms Modulation Logic to create the most accurate Body Composition Scales available in the industry. Analysis can be performed at any time of day and under almost any circumstances, resulting in the greatest flexibility of any body composition analyzer. Performing a detailed body composition analysis and educating patients about the results provides a valuable service that can impact patient health and drive revenue. 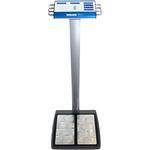 Get results quickly and easily with minimal data entry and 15 second measurement time. Users can learn to use the product in a few minutes, aided by clear prompts built into the scale. Exclusive to the G6 Series, users can choose from 3 graphic printout formats that help educate patients. Options include Adult/Bariatric, Pediatric and Fitness printouts. These personalized printouts provide patients with complete information about their body composition and information regarding the health risks associated with being overweight. The G6 Series Body Composition Scale is available in 4 configurations: whole-body (adult only or adult/pediatric), segmented and upper-body models. 15 Second Measurement Time - On screen display delivers rapid access to weight, body fat %, body water %, lean mass, BMR & BMI with a full illustrated printout in 60 seconds. Few Pretest Requirements - Analysis can be performed at any time of day and under almost any circumstances, resulting in the greatest flexibility of any body composition analyzer. High Capacity - The scale features an industry leading 1000 lb capacity, that provides the flexibility and accuracy to weigh any patient.